Portable X-ray Fluorescence (pXRF) analyzers from Olympus offer real-time, high-performance geochemical data for quick multi-element characterization of rocks, ores, and soils. Of late, considerable developments in pXRF technology have greatly enhanced the limits of detection and number of elements quantified and they have also decreased analysis test times to a large extent. Presently, pXRF is employed as an effective technique for studying and in the production of nickel laterite mineralization. It is regularly used in trenching, reconnaissance drilling, stockpile verification, face sampling, and on concentrates products. Nickel is present in two major types of deposits such as magmatic (volcanic) sulfide deposits and nickel laterites. While nickel laterites hold about 70% of nickel reserves, most ancient nickel production has originated from nickel sulfides. This is now changing due to depletion of nickel sulfide reserves and a gradual increase in the global consumption of nickel every year. Another desired by-product of mining nickel laterites is their cobalt concentrates, which are particularly important due to the rapid promising growth of battery metals. Nickel laterites are produced through the severe weathering of nickel-bearing ultramafic bedrock that is created by prolonged mechanical and chemical weathering in warm, wet, tropical environments. Nickel laterites have extended tabular bodies, which are over several hundred meters long, but just tens of meters deep. These deposits contain a predictable weathering profile that has five “zones” (see below) — the un-weathered ultramafic bedrock, the weathered bedrock or “saprolite”, a clay-rich layer, limonite zone, and a ferricrust or “iron cap”. A Vanta pXRF analyzer being used to sample stockpiles (above) and sample active open cut mine faces in New Caledonia (below). The shallow, tabular ore body geometry as well as open-cut mining techniques used to mine nickel laterites enable pXRF to be effectively employed across the whole mining value chain for a majority of the vital element set (Cr, Mn, Fe, Co, Ni, Mg, Al, and Si). Extraction and processing of nickel laterites usually necessitate extremely large-scale acid leaching or roasting in rotating autoclaves or kilns, and therefore mixing a constant ore feed is vital for optimizing the recovery of Ni (and Co). As a result, pXRF is usually utilized from the exploration phase (diamond percussion drilling), Run-of-Mine (stockpile management blending), grade control during mining (trenching face sampling), and also for examining final concentrate grades before transporting to a smelter. Field photos showing the various use cases for pXRF on a Nickel Laterite Project: On Diamond Drill Core, Face Sampling, Stockpile Sampling Concentrates in the Laboratory. Managing the intrinsic variability in moisture content during in-situ sampling is one of the challenges of utilizing pXRF on laterite deposits. Moisture interacts with the X-rays attenuating the signal received back to the detector, thus causing variation in the pXRF results. This usually leads to a low-bias or underestimation in the reported results. This bias can be rectified by developing moisture specific calibration techniques or by various drying methods. This can be as basic as drying the samples under the sun in aluminum or plastic containers, with the help of small, field-portable ovens or portable propane torch. Figure 2. Project-specific pXRF calibration data for Nickel Laterite (Saprolite) deposit in New Caledonia. 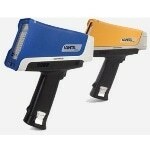 The Vanta handheld XRF analyzers are some of the most robust devices that have been developed by Olympus so far. These powerful, strong, and intuitive instruments offer quick, precise element analysis and alloy identifications to customers who require laboratory-quality results in the field.